This week’s meal comes from desperation to not go out to eat, but not really having anything on the meal plan. So here we have a buffalo chicken bake! It really was a simple recipe to prepare, and prep time was short. I boiled a package of chicken breasts to use for this recipe and to have some for another meal later on in the week. You could also just as easily go by the grocery store and pick up a rotisserie chicken and pull the meat off the bones. All that was left to do was put the ingredients together and bake! 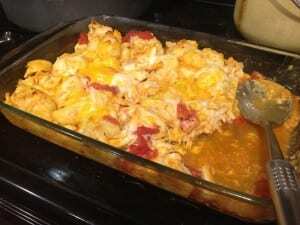 The ingredients included: shredded chicken, a can of diced tomatoes (undrained), shredded mozzarella cheese, shredded cheddar cheese, buffalo wing sauce (I used about half of a bottle), and a can of jumbo biscuits torn into chunks. I preheated the oven to 375 degrees and sprayed my glass 9×13 pan with cooking spray. Set some of the cheese aside to put on top of the dish. I put in all the ingredients and mixed them up in the pan and tossed it in the oven for about 15-20 minutes. Pull it out, spread the rest of the cheese on top, and stick it back in the oven until the cheese on top is melted and the dish is bubbly. I will be honest, I wasn’t sure how it would taste having the biscuits in there, but it was actually very tasty. My son asked as he was shoveling it in when I planned on making this again, so I think it must have been good. Preheat oven to 375 degrees. Spray a 9×13 glass pan. Cook and shred chicken and combine all ingredients in pan. Bake for 15-20 minutes. Remove and spread remaining cheese on top. Cook until cheese is melted and bubbling. Enjoy!